I was really pleased to see DeMarcus Ware on the list for the GMC Texas Tour for November, -but so was apparently everybody else. As a collector, I think it’s great to see other fans interested in meeting sports stars. It feels like a dying art when I am there all alone. However, the circus can be a bit much though, and I just wish a few of them would go away, especially when experienced autograph seekers get the blame for the inexperienced breaking all the unsaid rules. From bypassing lines to walk straight up to a player that isn’t even seated, to addressing a sensitive topic, players will always scoff at those who collect the most. I was a bit disappointed in my results from the tour in November and I had hoped to get Ware’s autograph on quite a few cards. 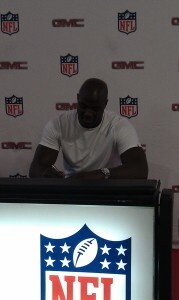 I earned the right to do so by taking the required amount of drives, earning vouchers from each drive to do so, and with the mixup mash up mistiming by Roy Williams, I was then left holding 8 autograph vouchers just for DeMarcus Ware. The GMC people first attempted to clear us out of the tent, stating that we were not allowed to form a line behind the queue for Roy to DeMarcus until 3:30. Instead we could all go outside and form a new ‘unofficial’ line for Ware. A bunch of people, myself included, ignored the woman, since we had already felt jilted by the Williams signing. Finally they let us all into the queue at 2:30. Eventually they limited everybody there to just one item due to the amount of people waiting in line. Autographs were rushed, and with a very efficient handler in the middle, nobody was able to really speak to or approach Ware close enough to do anything else. It was a very artificial and disappointing event. Still, I can’t complain about free, and I did get this Score 2009 signed by him even though I did a custom for him that I wanted to get signed at the event. 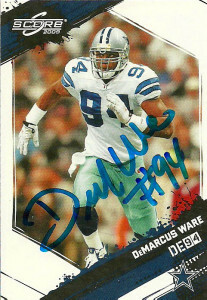 A member of the 100 sack club, DeMarcus has already established himself as the Dallas Cowboys’ All-Time leader in sacks, passing up the late Harvey Martin. The Sun Belt defensive player of the year in 2006, Ware recorded 195 tackles, 27.5 sacks, and 10 forced fumbles over his career at Troy. A four time All Pro in the NFL, and the 2008 NFL Defensive Player of the Year, DeMarcus has led the league in sacks in both 2008 (20) and 2010 (15.5).